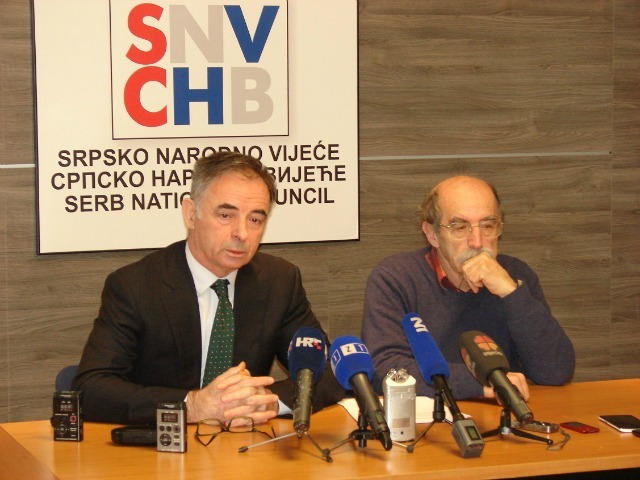 Croatia’s Serbian National Council, SNV, and the Civic Committee for Human Rights, GOLJP, on Thursday lodged a complaint about a local TV host who told people to beware of the “Chetniks” in Zagreb’s main Serbian Orthodox church. Marko Juric, host of the show “Marc’s Square”, named after an historic square, speaking on Z1 TV, on Tuesday told people in Zagreb, “especially mothers with children, to be careful that one of these Chetnic vicars doesn’t run out of the church and, in their best style of killing, start a bloody feast on our most beautiful Zagreb square”. He went on to add that a sign reading “Beware of aggressive Chetniks” should be installed on the surrounding Preradovic Square. The word Chetnik has many connotations in former Yugoslavia. Originally applied to Serbian royalist fighters in World War II, it later became a more pejorative expression, even more so during the wars of the 1990s when many Serbian paramilitary groups styled themselves “Chetniks”. Milorad Pupovac, head of the SNV and an MP, said such verbal attacks were “a consequence of the political campaign that was created in the last three years. “These are politics that think spreading fear is more important for Croatian national unity than democratic dialogue… That’s why this is not a case of Marko Juric and Z1 television. We’re talking about a political agenda that gains more and more space,” he said. Pupovac also said that such acts were intended to stop the “historical reconciliation of Catholics and Orthodox believers”, supported by Pope Francis himself. This was “a case that proves how much hate speech, calls for violence and lynching the society, media and the regulators can tolerate,” he added. Last year, there were five physical assaults on pupils from the Serbian Orthodox high school in Zagreb, he noted. The SNV has reported the case to the state attorney office and the agency for electronic media. Zoran Pusić, president of GOLJP, said that it was “the task of the majority to take care that the minority feels comfortable”, but that if the majority was not willing to do this, “no laws meant for sanctioning will help. “During the year, there was a trend towards assaults, not only on national minorities and Serbs in particular but on human rights activists,” he said, adding that anonymous persons had daubed chauvinistic words on his car, garage and on the building where his associations is based. Mirjana Rakic, president of the council for electronic media and head of the agency for electronic media, on Wednesday said the council “had an urgent meeting” and had told Z1 to respond to claims of making hate speech within 48 hours. “We’ll see what they say, and, as we ourselves can’t go beyond making a statement, will send the whole case to the state attorney,” she said. The agency can only issue warnings. Juric, who is also a columnist for the right-wing news portal Direktno.hr, has since sent a written statement defending his words on the grounds that Serbian Orthodox clergy in Croatia routinely “sing Chetnik songs”. “It was not my intention to offend anyone or discriminate on any basis, and if this happened by chance, of course I’m sorry about that,” he concluded.